Is the 90s cult TV drama Twin Peaks returning in some way, shape, or form? A pair of simultaneous tweets — referencing one of the show’s countless iconic catchphrases — from the series’ co-creators suggest something is up. 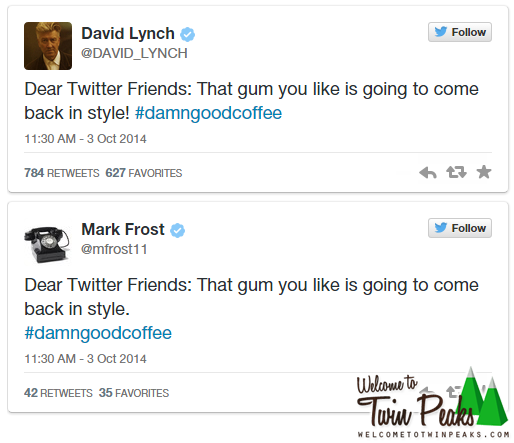 There have been rumors of new episodes of Twin Peaks previously, but those were directly refuted by Lynch. Ted Sarandos at Netflix is on the record, however, as saying that he would “absolutely” bring Twin Peaks back given the opportunity. It’s quite possible that others in the industry share his enthusiasm, as well. Netflix does offer the series’ two early-90s seasons, and a fancy Blu-Ray set was released this year as well. One could say that Twin Peaks is in the air. One could, however, say a lot of things. The fact remains that many are excited about this rumor. The show — which is often erroneously described as a mystery, but which contained no coherent or solvable puzzles at its heart — ran on ABC for two seasons beginning in 1990. It, more or less, told the story of Special Agent Dale Cooper (played with endearing strangeness by Kyle MacLachlan), a G-Man sent to the secluded, presumably Pacific Northwestern town of Twin Peaks to investigate the brutal murder of popular high school student, Laura Palmer. Over the course of the program’s two seasons, Cooper and the audience are dragged into the dark, surreal heart of the, at first, seemingly idyllic hamlet; as we learn the strange and varied secrets of its many inhabitants. The rumors of this possible revival are explored more in depth at the Twin Peaks fansite, Welcome to Twin Peaks here.